04.07.2010 Updated the code for the file “WebpartTabs.js” to fix an issue with grouped webparts being expanded by default. Thanks to Bullvan for noticing. 02.02.2010 Update to add possibility to set the tab titles in an array. Useful when viewing multiple views of the same list in a list view. 12.01.2010: Updated the function “getWPTitle” in the code for the file “WebpartTabs.js”. 11.01.2010: Updated the code to allow multiple instances in one page. Please read trough the article as the approach has changed from the code posted two days ago. In this article i will describe a method for adding webparts in a webpart page as tabs somewhere in the page. I really like your Tabs in SharePoint form you posted. Is there any chance that you might create a tab container that places webparts on the page into it? For maximum user could they be selected by webpart ID and not by the zone. This way more than one tab container could be placed anywhere are the page. Take a look at “Easy Tabs” from Christophe at PathToSharepoint. If this is not what you need, let me know and i will look at it. Christophe’s Easy Tabs is an excellent webpart but it grabs everything within a webpart zone. What would be nice is to allow the selection of which webparts are to be placed in the tabs from the webpart zone. This will give one more ability to have more than one “Eays Tab” type webpart within a webpart zone. Multiple instances in one page. Optional arrays to specify which webpart’s to include and which to exclude from being “tabbed”. Preserves selected tab on page load – for filtering columns etc. The jQuery UI-library is found here. Find the theme of your choice – mine is “smootness” – and download the files (the only necessary files are “UI Core” and “Tabs”). The code for the file “WebpartTabs.js” is provided below. The way this script works is that you put a CEWP containing the code below the webparts you want to add to the tabs. If you want to add four webparts to the top of a webpart-page, you add the webparts from the top down, and places the CEWP with the script as webpart number five. The code then (if the webparts has not been excluded) consumes all the webparts stacked above, and adds them as tabs in the order of appearance. // In a webpart-page: Specify whether to hide the title – it must be present initially to use as "tab title"
// Call the script with an unique identifier of the "tabs-collection"
arrOfTabHeadings: Array of webpart titles. If this array contains a value for the current tabID, it is used in stead of the default title pulled from the webpart. To specify the title for tabID 2 you must set the array like this: [”,”,’This is the new title’]. Note that tabID 0 and 1 is not altered as the value for those are empty strings. // Code inactive in "edit page mode"
// Is it hidden or skipped? // Hide the webpart title? // Is it skipped or hidden? Save as “WebpartTabs.js” – mind the file extension, and upload to the scriptlibrary as shown above. This script may need a bit more testing so please let me know if you have some comments or finds a bug. hey alex .. pretty useful post .. thanks for sharing .. The code is now updated. I know you hate hearing from me lol. I see you have requests anyone in red. How about having the tabs in 2 rows, but dynamic, or maybe a setting to choose one or two rows. also how about a way to style the tabs, either matching the style of the site theme or ability to apply our own style. Maybe even rounded corners. The tabs do wrap in multiple lines if the CEWP is restricted in width. Is this designed to work on a list view page or only a webparts page? 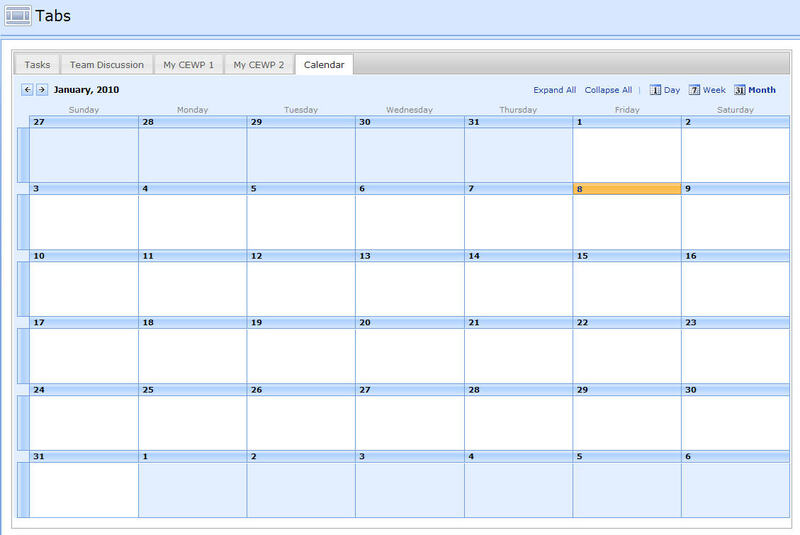 It does work in a list view, but it will not manage to get the “Tab title” from a calendar view. I want to use this tab arrangement with 3-4 views of the same List Web Part. Because the tab pulls the web part name, all the tabs would read the same. Perhaps, is there a way to pull the List View Appearance Title?… the title that I can manually type when I click Edit Page in “….aspx?PageView=Shared” mode? The webpart-titles cannot be used when using this feature in a “standard list page” and not a webpart page. As you noticed, the list name is used for all tabs containing a view of the list, regardless of the title. I have met this limitation myself and have updated the script with an optional array of tab-titles. I will post the updated code later tonight. This is a great improvement on the pathtosharepoint webpart as it doesn’t consume all the webparts on a page. It provides a solution for many pages on my companies intranet. However, I still have the limitation of not being able to use the web part ‘appearance’ titles for the tab headings. I think you suggest this can now be done but can you explain how as I can’t see what to change to effect it? 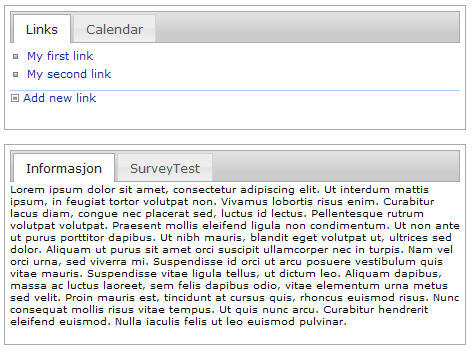 You should be able to use the web part appearance title, both in a web part page and in a list view. Just leave the array “arrOfTabHeadings” empty. I can’t find your email address on here? You find the email-address in the top section of the script “WebpartTabs.js”. I would like to know what the limitation was, please email me or comment in this post. I get an error when I try to use the solution. Any ideas on what might be causing the issue? Please double check that your scripts and CSS are loaded correctly. Are you sure that the jQuery UI library you downloaded includes the “Tabs-widget”? By using this method you get the some “intellisense”, as the ability to “Control+Click” to check the path of the referred scripts. If you have many webparts on one page, the tabs will continue on the next row, which is fine. However, the tabs on the bottom will shift depending on which tab is selected, leaving a grey space. The farther position the tab is to the right, the more the following row of tabs with shift, it’s almost like they are indenting (which will also trail to the next row). I see, the tabs themselves will break off from the bottom right of the selected tab, to show the hierarchy, but there is no hierarchy. I haven’t had the time to investigate, but the tabs are created using the jQuery UI widget “tabs”. See if you find something over there. I have not tested it in SP2010, please post back your findings. I’ve been playing around with SP 2010 and the above solution but just can’t get it working. I have gone with your suggested method of using SPD and Ctrl+Click to check the paths – all good. Have you tried SP 2010 yet? Sorry, but i have not had the time yet. Then you can carry on and should be fine to adapt it. Thanks for all the great scripts mate. I noticed one thing that bugs me – when in Tabs, list and library GROUPED views load as expanded although they should not (view settings are set to collapsed in initial state). With larger lists it may be a little uncomfortable. In which JS file should I look for the code responsible? TIA and thanks again for Your work. The code is updated to fix this issue. Nice one, but I have custom masterpage and I have observed that the tabs doesn’t show/work when I switch to this master. I’m sorry, but that would be impossible for me to tell without knowing what is changed in that specific master page. Is there a way to randomly select tabs on page load? Look at how this script remembers the selected tab during page refresh. The random “generator” must be made separately, but the code in line 64 shows you how to select a tab. Also, it would be nice to display two or more webparts horizontally under one tab and have an autoplay option like Christophe’s. Sorry, but i do not have any plans on implementing that – there is not enough time to handle all requests… Go with Christophe’s solution if you need that functionality. Hey this is really great! I was wondering how this handled individual web part refreshing? I currently have web parts that use update panels but I found this solution is insufficient towards my performance needs as update panels actually do an invisible full postback…does your web part handle true asynchronous refreshing? Let me calrify this, I am currently looking for a good way to display chart controls that run complex SQL Queries returning large amounts of results. A tabbed menu acting as a sort of reports dashboard would be ideal, but I am trying to limit the bandwidth on filtering one chart to only refresh that chart itself. Being somewhat of a novice with AJAX/JQuery/and Web Services, I am assuming that I will need to implement my own asynchronous refresh for these charts? Thanks! This is no more than a “client side rearrangement” of the existing web parts in the page. It adds no extra functionality other than the visual tabbed look. Each web part in the page behaves as it would do on a “non-tabbed” page – including full page reload on filtering. has somebody found a way to use this with sharepoint 2010? looks great. I will try the new solution next days. I hope you will find the time to “update” the code for webpart tabbing. Can you give us a hint where the problem with webpart tabbing maybe is? So we can try to find problem with the webparts tabbing. I have been looking for a solution just like this. Sadly though we use SP2010 and this doesn’t work. You mentioned earlier about modifying the code. Have you had a chance to look at this yet? Would love to use this on our Intranet site. Hey Alexander, great work! I have this working in 2010, but am not able to see the SPRibbon when an item or document are selected. Have you run into this? I have confirmed your findings, but have no fix for them now, sorry. I have SQL Reporting Service Report Webparts (charts/graphs) that I want to display 2-3 on each tab. How can I achieve this with your sample code? Im not much of a developer but this task was given to me. I appreciate any advice or help you can give. There are no quick fix for adding multiple web parts on one tab, sorry. I might update this later on as i have another way of addressing this issues that may support SP2010 (it is not tested) , but I do not have the time right now. Hi, It’s on the list of things to do, but I do not know exactly when i get to do it. I am using it in my site . i need to show 5 web parts in tab structure among i want to show three web parts together in one single tab and rest 2 web parts in different tabs. how can i achieve it???? I think you should look at Christophe’s easy tabs (linked in the top of this article). However, was wondering if you got a chance to fix the code above to work in SP 2010 ? Have you done any updates for SP2013? Sorry, but I have no SP2013 version. The tabs are left aligned here and not utilizing the entire width available. I tried to get them center aligned and give them max possible width, but I am not able to do so, can you please help. I basically want to tabs to be of same width and consume the entire width available to the tab web part. I do not have this solution active anywhere and cannot look at it live. Try using the developer console (f12) to identify the container you want to give 100% width and then add some CSS to the CEWP to address it and set width:100%. Hi there, just adding my vote for an updated version. I’m still on 2010 but will be moving to 2013 by end of year. This solution has some excellent features that I can’t get from Easy Tabs, like Multiple instances in one page, Optional arrays to specify which webpart’s to include and which to exclude from being “tabbed”, Works in webpart pages and in list views. Any chance upgrading this for 2010/13 is on your roadmap? I have some other solutions I must update first, but I have added a note and will see what I can do. Does this work on wiki pages? I’m not sure, but I have my doubts – test it and post back what you find.